Ten years after the devastating 2004 Indian Ocean tsunami, Aceh provides an example of remarkable resilience and recovery that reflects the combination of individual ingenuity, family and community engagement and the impact of domestic and international aid. The tsunami devastated thousands of communities in countries bordering the Indian Ocean. 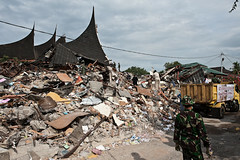 Destruction was greatest in the Indonesian provinces of Aceh and North Sumatra, where an estimated 170,000 people perished and the built and natural environment was damaged along hundreds of kilometers of coastline. In response, the Indonesian government, donors, NGOs and individuals contributed roughly $7 billion in aid and the government established a high-level bureau based in Aceh to organize recovery work. To shed light on how individuals, communities, and families were affected by and responded to the disaster in the short and medium term, we established the Study of the Tsunami Aftermath and Recovery (STAR). Beginning in 2005, STAR has followed over 30,000 people who were first enumerated in 2004 (pre-tsunami) in 487 communities (community location depicted in the figure below), as part of a population-representative household survey conducted by Statistics Indonesia. Interviews were conducted annually for 5 years after the tsunami; the ten-year follow-up is currently in the field. We ascertained survival status for 98% of the original pre-tsunami respondents and have interviewed 96% of survivors. The study is designed to provide information on the short-term costs and longer-term recovery for people in very badly damaged communities and in comparison communities where the disaster had little direct impact. Pig farmers in Nias pull a 'waste disappearing act' by converting manure into useable energy. At one of my trips to Nias, Indonesia, I discovered that a pig pen can actually be so clean without any spot of dirt or waste. It was something I have never imagined after seeing pig farms that have mud (of all kinds all) all over the place. You can imagine what it would look like, right? The clean pig pen I saw was in the village of Tetehosi, Idanagawo sub-district owned by a farm group with the name Ternak Harapan Maju which means, “Farm Hopes to Progress.” The pen is managed by priest Sabar Markus Lase, not only because he knows about pig farming, but also because the pig pen is in the backyard of the church.